‘Impress’ has been curated by students on the MA Curating the Art Museum programme at the Courtauld Institute and directly responds to another of the Courtauld Gallery’s exhibitions ‘Bruegel to Freud: Prints from the Courtauld Gallery’ (which continues until 21 September 2014). It incorporates a rich variety of works from the Courtauld Gallery collection and the lesser-known Arts Council Collection. Richard Long, A Line Made by Walking, 1967. Black and white photograph. © Richard Long, All Rights Reserved, DACS 2014. 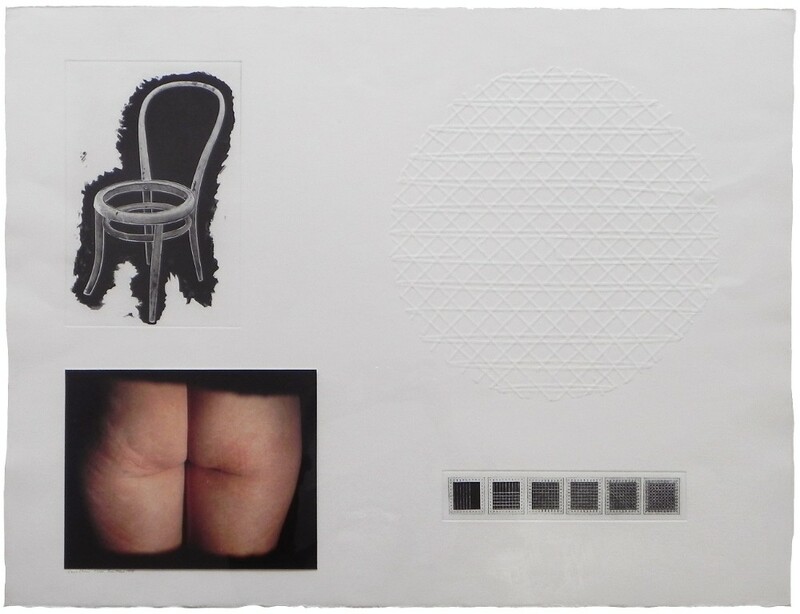 Top: Tim Mara, Cane Chair, 1978. Photo-etching and embossing on paper. © The Tim and Belinda Mara Trust. Courtesy of Advanced Graphics London. The exhibition takes Richard Long’s A Line Made by Walking as its point of departure. 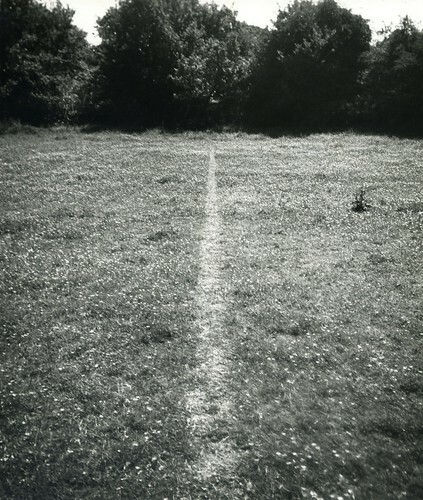 Long’s work is a mounted black and white photograph of the impression made by the artist’s body as he walked backwards and forwards across a field, which created a single straight line in the grass. As seen in many of his works – including his 1984 work River Avon Mud Hand Spiral which can be found in the adjacent room – A Line Made by Walking draws upon the classic theme of man’s relationship with nature. Long’s emphasis on physical connections with three-dimensional surroundings is arguably at the centre of this exhibition. Anna Barriball, Sunrise / Sunset V, 2008. Pencil on paper. Courtesy of the artist and Frith Street Gallery, London. This theme is explored in many ways and in different media throughout, for example, in Anna Barriball’s Sunrise / Sunset V. Barriball’s rubbing on paper takes a fundamental form of print-making that we learn as children to an extreme. She uses the metal matter of her pencil to re-create the textures of an art-deco inspired stained-glass window. The effect is monumental, dense and heavy – similar to the lead that is used to bind the original glass-work together. This heaviness contrasts with the lightness of the paper that the rubbing is made from. Unexpected contrasts such as these are a strength of the exhibition. Paul Coldwell’s My Father’s Coat III contains a different kind of contrast, this time between man and machine. Coldwell was one of the first artists to explore the relationship between digital technology and more traditional print making techniques. 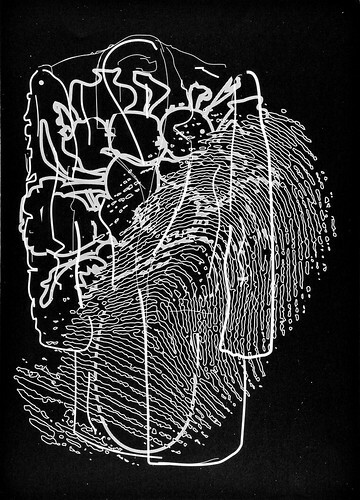 My Father’s Coat III was drawn using a computer and then etched as a print. 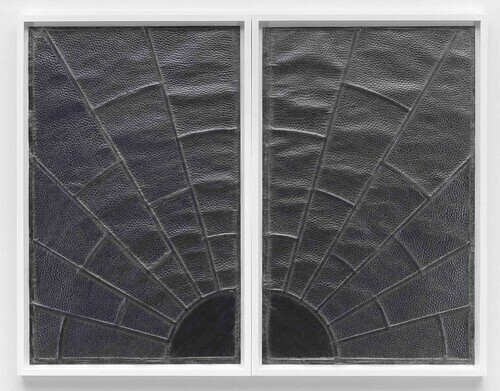 However, like Barriball’s Sunrise / Sunset V, Coldwell’s work also pays tribute to the transformative power of medium: paper to metal and digital print to etching. Paul Coldwell, My Father’s Coat III, 1996. Etching on Paper. Courtesy of the artist. What is clear throughout this exhibition is the role the body plays in the act of printing, whether it is the body’s mark-making on the ground below their feet, the pressure required to blacken paper with graphite or the identifying fingerprint reproduced on the page. As such, ‘Impress’ challenges the parameters that we place around the practice and asserts that print-making is alive and kicking. ‘Impress: Print Making Expanded in Contemporary Art’ continues until 20 July 2014 at the Courtauld Gallery in Somerset House, London. Raphael Hefti, Untitled from the ‘Lycopodium’ series, 2012. 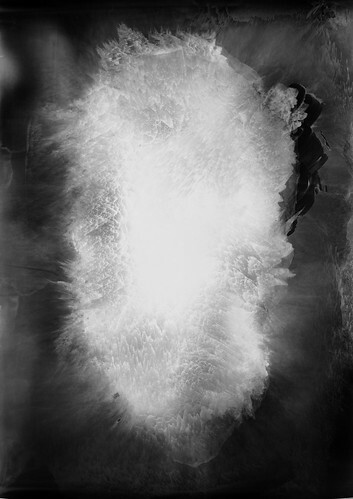 Photogram on photopaper. Courtesy of Ancient & Modern Gallery, London.